If you have been injured in a motorcycle accident, contact a Los Angeles motorcycle accident lawyer at The Reeves Law Group. Our attorneys have been helping motorcycle accident victims throughout Los Angeles, and the rest of Southern California for over 25 years. According to the California Office of Traffic Safety, there were approximately 4,500 motorcycle accident victims that were injured and killed in Los Angeles County in 2015. When a person is involved in a motorcycle accident, the physical and financial damage can be extreme and the path to recovery can be long. If you have been in an accident that you believe was caused by another party’s negligence, you will need an attorney with expertise in representing motorcycle injury victims. A skilled motorcycle accident attorney will have a deep understanding of the legal process necessary to manage your case from start to finish. This will help you earn the compensation that you need to overcome the harm done by the accident. If you need to consult an experienced motorcycle accident attorney, call The Reeves Law Group today. Contact us for a free consultation. Our Los Angeles office is located at 1055 West 7th Street, Suite 3333, Los Angeles, CA 90017. The Reeves Law Group is actually located in the building where I work, so that’s the main reason I chose them. Attorney Neil Berry had a good response rate and is a super to the point type of guy. I was injured on a motorcycle and needed stitches in my leg. I am very satisfied with the settlement I received. Neil’s assistant Laura was really helpful and gave quick responses via email. I am overall very satisfied and would recommend The Reeves Law Group to anyone in a serious accident. Motorcycle accidents are generally considered the worst type of crashes since motorcycles can be driven at high speeds and do not offer their riders much protection. Researchers have noted that 98% result in injuries. Many accidents end in serious injury or death. The National Highway Traffic Safety Administration, the division of the U.S. Department of Transportation tasked with road safety, has noted that a motorcycle rider is 8 times more likely to be injured and 37 times more likely to die in an accident than the occupant of a car in an automobile accident. In the past decade, accident deaths have doubled, in part due to more motorcycles being purchased each year, not only by younger riders who have less experience riding but, increasingly, by riders over 40 who have slower reaction times. Also, there is more congestion on our streets and drivers travel at faster speeds. If you or a loved one have been injured in a motorcycle accident, contact the motorcycle accident attorneys at The Reeves Law Group today! 30% of all motorcycle injuries are to the legs and feet. 22% of injuries are to the head and neck. Serious injuries can be limited if the rider uses quality safety equipment. For instance, a helmet should cover the entire face, fit well, and be less than 5 years old. The glue that holds the protective material together deteriorates over time and a poorly-fitting helmet may come apart during an accident. In 2010, 4,502 motorcyclists were killed in accidents. On average, 90,000 motorcyclists are injured in riding accidents each year. Motorcycle fatalities make up 14% of all motor vehicle deaths, even though motorcycles account for less than 1% of all miles driven. Motorcycle fatalities have doubled in the last decade, even though vehicle fatalities are decreasing for cars and trucks. Motorcycle accidents can occur when drivers in other vehicles are not aware of a motorcycle rider’s speed or closeness to their car or truck. Researchers at Texas Tech University found that the human brain has a harder time accurately perceiving small objects that are close by than larger objects that are farther away. The implication for motorcycle riders is that drivers in cars and trucks may have a hard time accurately knowing how close motorcyclists are to their vehicles and may be unable to judge the motorcyclist’s speed, increasing the chance of an accident. Driver Error. The most common motorcycle accident is when a car turns in front of a bike, hits the motorcyclist while changing lanes, or runs into the biker at a stop light. Common reasons for the driver not seeing the motorcyclist are: inattention, distractions, blind spots and that the driver is looking for cars rather than motorcycles. Motorcycles can easily fit into blind spots and drivers looking for cars aren’t psychologically programmed to see motorcycles. Faulty Equipment. Accidents can happen even when no driver is at fault. Vehicle defects that slip past the manufacturer can cause an accident or faulty safety equipment may fail to protect the travelers the way it should. When products fail and cause harm that should have been avoided, a skilled lawyer may find it necessary to pursue a products liability case. Dangerous Conditions. Motorcycle technology has developed over the years to improve rider safety. Many bikes now come equipped with anti-lock braking systems and traction control. These developments still may not eliminate all dangers. Poorly maintained roads, liquids that are leaked or spilled on surfaces, or improperly engineered streets and highways can lead to accidents and injuries. Escape Immediate Danger. The scene of a motorcycle accident can be extremely dangerous. 62% of wrecks involve fuel leaks and spills that could turn into fires. Other drivers may not realize that an accident has happened and may be slow to brake or move around the crash site. Your first step should be to move to a safe place. Get Medical Care. If you are injured, you should be taken to an emergency room for prompt medical care. Head and chest injuries are among the primary causes of death, so you should request immediate examinations that include diagnostic tests like X-rays and MRIs. Report the Accident. Unless you are transported from the scene by ambulance, call the police and report the crash. A police report will document the facts of the wreck and will identify the parties involved, along with any witnesses. Call a Reputable Los Angeles Motorcycle Accident Attorney. Determining fault requires a detailed investigation that must be done before evidence and witnesses disappear. An attorney who understands California law and how to build a case will manage your claim from the outset and will help in many different areas, like getting the medical care that you need. Drivers, Owners, and Employers. Drivers and owners of vehicles who cause an accident are responsible for the injuries the wreck inflicts. But responsibility does not end there. If your accident was caused by a driver who was on the job or driving a company car or truck, you would be able to pursue compensation not just against the driver, but his or her employer as well. Governmental Entities. When a defective design, construction, or maintenance of public roadways results in a dangerous condition, the governmental entity that is responsible for those roadways bears blame for your motorcycle accident. Claims against governmental entities, however, have strict filing deadlines, usually as short as six months. It is imperative that you consult with a lawyer right away so that you don’t lose your right to your claim. Manufacturers. If a defective motorcycle design, manufacture, or assembly contributed to the crash, the maker of the motorcycle would be a target defendant in your case. If there is a failure in safety gear, like a helmet that didn’t protect the way it was supposed to, then the manufacturer and seller would be further sources of recovery. Studies have shown that the losses from motorcycle accidents can be 4 to 12 times higher than losses from other vehicular accidents. A skilled Los Angeles motorcycle accident lawyer can help you recover many of the expenses from an accident. Medical Bills. Serious injuries sustained in a motorcycle crash can trigger astronomical bills. For example, hospitalization at a trauma center for a head injury can cost upwards of $30,000 to $40,000. You may be entitled to recover the costs for any hospital stays, surgery, doctors’ visits, diagnostic tests, physical and rehabilitative therapy, and chiropractic care. You may be entitled to the costs of future medical care, if your conditions require ongoing treatment. Pain and Suffering. A motorcycle accident may inflict a wide range of injuries, whether they be temporary, such as road rash, longer-term, such as broken bones, or disabling, such as a severed spine or trauma to the brain. The law allows for compensation for the pain and suffering associated with such injuries, but does not provide a fixed formula to calculate the compensation. To recover the maximum amount that your injuries warrant, you will need the help of an expert lawyer who has the knowledge and experience to best evaluate your claim. Wage Loss. If your injuries prevent you from working, then all your lost wages may be included in any claim for recovery. Even if you used sick leave or vacation time during the recovery period, reimbursement may be available. What if your injuries leave you permanently disabled and unable to work ever again? In conjunction with an economist, a lawyer can calculate your future losses and recover for your reduction in earning capacity. Although punitive damages, aimed at punishing a party at fault, are rare in motorcycle accident cases, they may be appropriate in certain instances, such as when a driver who caused the motorcycle crash was motivated by road rage or was driving while under the influence of alcohol. In order to recover compensation for injuries sustained in a traffic accident, the law of negligence requires you to prove that the crash was the fault of another driver or entity. A thorough investigation of a vehicle accident is usually complicated, requiring a skilled lawyer located within California who has the ability to establish driver fault or find an alternative cause for the accident. Establishing Driver Fault. Statistics show that nearly 70% of motorcycle accidents involving other vehicles are caused by drivers who violate a motorcyclist’s right of way. Failing to check blind spots, misjudging the speed of a motorcycle, and tailgating can often lead to an accident. Assessing Road Conditions. Studies have shown that road conditions like undivided highways, curves, and defects like potholes and pavement ridges are contributing factors in motorcycle crash injuries and fatalities. Intersections have a high incidence of multi-vehicle motorcycle accidents, while many single-vehicle accidents occur along curves and on undivided highways. Why? Is there a problem with the design or construction of these roadways? Are they furnished with appropriate signs? Do their traffic controls function properly? These are key questions to be asked during the investigation. Inspecting Bikes and Safety Gear. Up to 3% of accidents are caused by vehicle failure. An expert will inspect the bike and determine how the breakdown caused the accident. Additionally, it is important to review safety gear to see if the equipment complies with government standards. For instance, all helmets have to meet Federal Motor Vehicle Safety Standard 218. In the case of a head injury, it is necessary to assess the helmet’s performance in the crash by examining its style and weight, the thickness of its lining, and the sturdiness of its chin strap and rivets. Oftentimes, bikers are partly blamed for a motorcycle crash based on arguments that they were driving too fast or veering in and out of lanes in an unsafe manner. 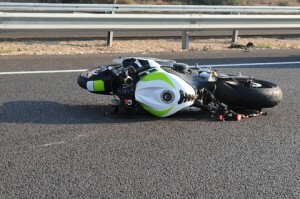 Comparative negligence on the part of the motorcycle rider may result in a reduction of damages. If the motorcyclist is found to be 10% at fault for the accident, then the motorcyclist’s recovery is reduced by 10%. If he is deemed 50% at fault, then his damages are cut in half. A law firm must protect their client’s interests by making every effort to negate any comparative negligence arguments. To prevail in your claim, an attorney must be able to handle the complexities of your case. Your attorney should manage all of the following tasks. The Reeves Law Group is known as a premiere California law firm with lawyers particularly experienced in handling motorcycle accident cases in Los Angeles, and throughout southern California. Our motorcycle accident attorneys have won thousands of accident cases and have the resources to help you obtain the highest recovery possible. Contact us today for a free consultation.